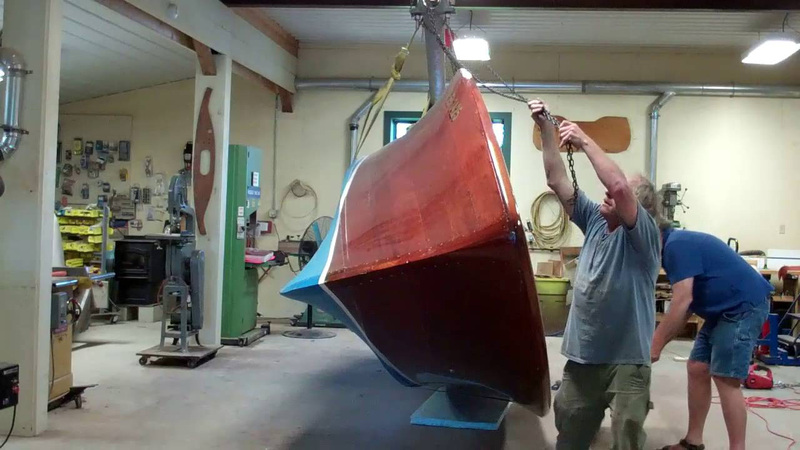 If you remember the challenges we faced flipping my 22’ Shepherd runabout, you will understand why a bit of tension was in the air as we approached flipping the 1946 Chris-Craft mahogany U22. But this time we used our good friend Phil Jones’ “line and winch approach. The line is secured to one of the bilge stringers – port in this case, from which point it is passed over the port gunwale, wrapped around the hull, across the cockpit and past the port gunwale. The bitter end is then attached to a small hand-held winch, which we secured to the base of our 27” drum sander. Rolling her 90 degrees is accomplished by hand with relatively little effort. It is getting the starboard gunwale beyond 12 O’clock that is the challenge. The winch and line take over at this point and slowly roll the hull past vertical, while maintaining total control. As you can watch in the clip, she slowly, almost deliberately rolls clockwise and settles 180 degrees from upright. Roll the dollies beneath her, lower onto them,, release the straps and she is ready for what comes next. You will notice that we inadvertently placed the aft strap, well, a bit too far aft, so that it jumps off the roller just as we complete the flip. Note to self: position the straps at least a foot in from the ends in the future! However, working on the bottom with the keel 7 feet off the floor is very difficult. Tomorrow morning we will use four chain falls and the two straps to raise her slightly and then settle her on super short dollies. Next …. Michael “gets” to strip all that blue paint off the bottom planks prior to releasing and attempting to save them.